December release is live now. Its mainly a bugfix release, but some new features made it to this release also. You can check our Roadmap for features to come. We added support for creating groups of Product Plans. This enables you to put your cards in logical groups that can be embedded into other websites. 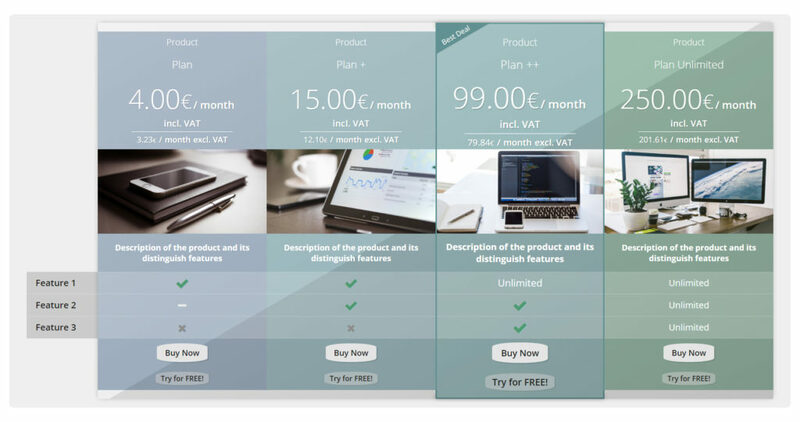 Plan Groups allow you to put products side to side in a regular or a compare layout. In the future these groups may be used in combination with the embeddable order process that we are working on. Some breaking changes were needed for the Pilvi Embedded library theming side, so upgrading from previous 0.0.X version to the latest 0.1.2 version is highly recommended. Update the code on your site to point to the latest 0.1.2 version. See example here. Login to your account and make some small change for the existing Product Card theme you were using. This can be the name of the theme or some variable value. This triggers a theme refresh and your Product Cards should look the same again. We apologize for this inconvenience and try prevent this kind of changes in the following releases. More changes have landed on the Messaging Center for this release. You’ll be able to customize your own messages and to control when they are send to your customers. Not all messages are editable at this point but we’ll be bringing in more in the future. We are working on bringing you further enhancements on the UI/UX front. Our new refreshed theme will be taking some influence from Google’s Material Design Spec.